Since becoming a professional photographer it’s been important to me to be a part of the photographic community and continue my professional and creative development. I became an accredited member of the NZIPP when working in NZ and as soon as I moved to Australia I also joined and became accredited with the AIPP (Australian Institute for Professional Photographers). 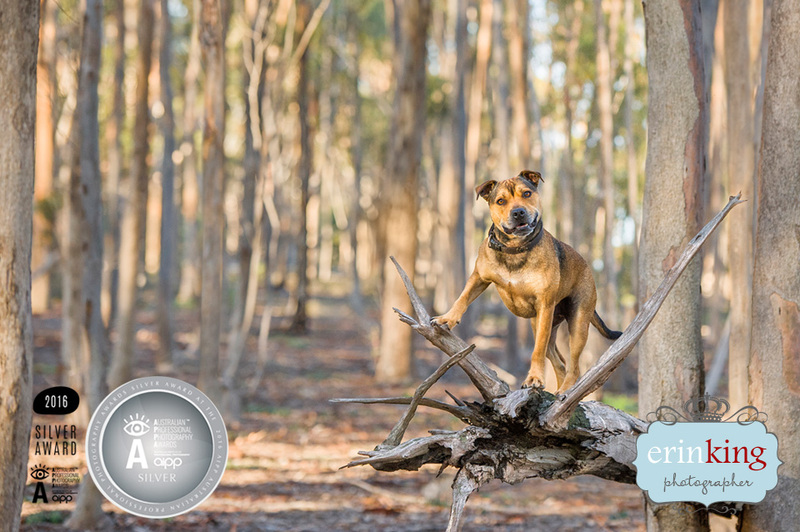 Every year the AIPP run the Australian Professional Photography Awards (APPA’s) and for the last 2 years, since the addition of the Pet/Animal category, I’ve entered my work into both the Victorian State level awards and National level awards. The awards have been a great way for me to keep pushing myself creatively and also to receive acknowledgment and recognition for the professional level of photographic work I am producing. So far over the last 2 years I’ve been awarded 4 Silvers in the Victorian awards resulting in being a finalist for Victorian Pet/Animal Photographer of the year and also 3 Silvers and 1 Silver with Distinction in the National awards. While it’s an amazing high to win awards, it also takes it’s toll emotionally and mentally. It’s not easy putting your work on display to be judged and critiqued in front of so many other professionals in the industry, in fact it’s bloody nerve racking! So much work, literally blood, sweat, tears, sleep deprivation, time and money, has been put into each image. It often takes hours and hours working on it to get it just right to the point that you do become very attached and invested in each image. It’s lucky there is a deadline for submissions as you could literally just keep coming back and continually tweaking until it drives you mad! And although this process is really hard, it’s also somewhat addictive. Having such high expectations of myself and my images, means I can’t help feeling a little disappointment that my images didn’t do better, but this just means I have to keep entering and striving to hopefully one day achieve a Gold. This year I was happy to break past a Silver but now I want Gold all the more! It’s a very personal thing to be given a score which essentially tells you whether your image is good enough or not. I already have very high expectations of myself and my imagery so it’s hard not to feel disappointment if this isn’t reflected in the judging. The judging panel is made up of 5 judges who each score the image and then the final score is the average of these 5 scores. If there is a large variation between these scores, there can be a challenge where the judges will discuss the image and why they feel it’s worth that score. After discussion they will re-score. Judges are always going to be looking for originality and uniqueness within the concept, the level of emotion and whether the image conveys a strong story. And just as important is the overall photographic quality, technical skill and the printing and presentation of the image. Australia only awards Silver and Gold, compared to NZ who also awards a Bronze. Silver is 80-84, Silver with Distinction 85-89, Gold 90-94 Gold Distinction 95-100. 75-79 is considered to be of a good Professional Standard. Most of my entries have been derived from photos taken during my client sessions. However the images have also been re-worked in Photoshop to try and take them beyond just being a good image. I do have some conceptual ideas bouncing around in my head, which I would like to explore to try and create imagery specifically for the purpose of the awards. This would be a big project in itself and one I’m a little scared to embark on, to be honest, but I hope I can put some time aside to try this. So I thought I’d share with you what it has taken to achieve the results of each photo that I have had awarded. I’ll share each photo in a separate post, as otherwise you’ll be reading this all day! I’ll start with my image of Bear, the Staffy. This was a new image being entered for the first time. Straight out of camera. A little under exposed. Colour corrected and further warmed up. After attending a print critique (which the AIPP run prior to the submission deadlines) the feedback I received was to remove the tree directly behind the dog’s back end and also to add another light source onto the dog to really bring the dog out of the image. Removed the tree directly behind dogs back end. Worked on minimising distracting highlights in background. Worked further on evening up and dulling down harsh highlights throughout background. Replaced trees where highlight was too distracting. Brightened up the dog as well as branch he’s standing on. With the final image I decided on a closer crop to bring more focus to the dog. If you want to create something unique and original and possibly have a creative concept you would like to explore, please let me know and we can work together to create it!